Curried Cabbage: I pity the fool who doesn't drink tea! 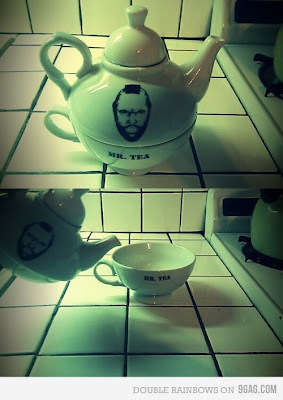 I pity the fool who doesn't drink tea! I'm one of those tea drinkers who once spent $50.00 on a tin of tea. It had to happen. It was the best tea, ever. Not to say that I don't enjoy a good cup of coffee (and by "enjoy a good cup of coffee" I mean a few a day, cause I love me some coffee). I don't really put coffee and tea in the same category though. They're both hot beverages, to be sure, but the influences are completely different. Two different schools of food thought with an amazing history. That being said, this post isn't about their rich history, but the fact that I can't live without the following teapot. There's no source attached to the picture. Whoever made it, I love you. Be my friend.